Welcome to Freddy's Cat-a-tonic Catnip Toyz! ***Freddy has expanded and has a new section of cat and pet beds, cat, dog and ferret sleeping napsacks, cat mats in various sizes and fleece cat, dog, pet blankets. Handmade premium catnip toys made from soft durable flannel (and thick furry flannel too) and stuffed with the best 100% grade A Organic Catnip in the USA. Guaranteed to give your furry feline beasts hours of playful catnip bliss. Freddy's Cat-a-tonic Catnip Toyz are extra stuffed with organic catnip...there's no skimping on catnip in these toys! We specialize in large size catnip toys because every kitty needs their very own big furry toy to cuddle and play with just like human kids. We also have small and medium size toys too. We aim to please even the most finicky of felines. Freddy's Cat-a-tonic Catnip Toyz are all handmade and durable and will not fall apart. Double sewn to ensure all Cat-a-tonic Catnip stays inside the Toyz. All Freddy's Cat-a-tonic Catnip Toyz are in the shapes of felines favorite playthings like pepperoni pizza, donuts, Voodoo dolls, whales, fish, bunnies, bats, carrots, bananas, Red Hot Chili Peppers, fortune cookies, stingrays, watermelon, cupcakes, poptarts, aliens, rocket ice pops, sharks, Peeps, goldfish, hearts, etc. and even skulls because who doesn't like skullie toys! Feline Tested....Owner and Felines Approved! Hello Kitties and their humans, this is Freddy's mom. I'm the designer of all of Freddy's Cat-a-tonic Catnip Toyz, Catnip Cat Mats and Fleece Blankets. 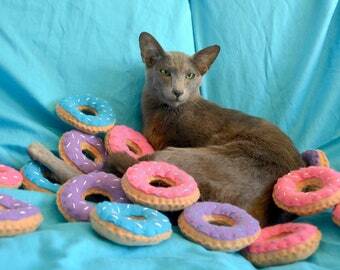 I've been a proud mom of over a dozen kitties in my life--mostly my beloved Oriental Shorthairs. I've nursed some of my furbabies who had cancer, lymphoma and other deadly diseases that I ultimately lost. I'm sure all of you can relate to this. I became very conscious of what I let my kitties play with and sleep on. I spent lots of money on store bought toys that ended up falling apart (especially ones with bells, which are so hazardous to kitties if they accidentally swallow them) or my cats would smell them and walk away. While I was bringing my sick kitties back and forth to vets, the stress alone for them was so traumatic. So I started putting in a nice fluffy blanket for them in their carriers to make them feel a little more comfortable. I designed my catnip cat mats based on ones that I bought at cat shows that were just a double-sided piece of cotton fabric. Most of the times, no catnip was supplied. When a store in MA started carrying my flannel catnip toys, the owner asked if I could make catnip cat mats. So I designed my version that I knew my kitties loved--one side is cozy fleece material, the other side is cotton fabric and the middle is batting to give it that pillowy feel. I'm posting a video of my cat mats and how to put the catnip in with washing instructions. I'd like to stress that I used high quality 100% organic catnip made right here in the United States. I don't skimp on my catnip because honestly I want the best for kitties. Like all cat parents out there, you worry about what you give your kitties. I know I do, especially when you've had sick cats. Freddy's Cat-a-tonic Cat Products have been in pet store in New England: CT, NH. ME, MA--Boston & (Salem, MA in two store locations--they carried my Halloween-themed catnip cat mats and catnip toys year round for the tourists that visited.) I was contacted by happy customers who bought them from there. But, truth be told, if you came across Freddy's Cat-a-tonic Cat products at any of these store locations, they marked the prices up dramatically. So I opened my Etsy store with my prices which are reasonably priced for handmade products for cats. I put a lot of time, care and workmanship into my products and get the best materials and high quality 100% organic catnip made in the USA. 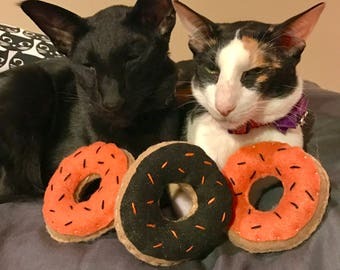 When you're buying for your kitties in pet stores and other stores, you're not really sure where these products were made and if the quality is good. I have a number of happy cat customers and their humans who contact me to rave about how much their kitties love my products. Freddy and I love getting photos of kitties and doggies enjoying their Freddy's Cat-a-tonic cat product. Yes, I do make doggie fleece blankets. On Freddy's Facebook page I've posted all the photos and videos of my happy customers. Just seeing the kitties and doggies enjoying my products makes it so rewarding for me as the designer. Just remember, all of the cat items that I make are made with love and quality materials. Only the best for our kitties because I, too, am a kitty parent--actually six of them. 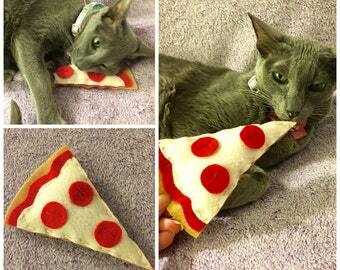 Feline Tested…Owner and Felines Approved! Handmade premium catnip toys made from soft durable flannel (and thick furry flannel too) and stuffed with the best 100% grade A Organic Catnip in the USA. Guaranteed to give your furry feline beasts hours of playful catnip bliss. Freddy's Cat-a-tonic Catnip Toyz are all handmade and durable and will not fall apart. Double sewn to ensure all Cat-a-tonic Catnip stays inside the Toyz.